A person born under the sign of Cancer Earth Tiger is caring. If you come across them, they will make themselves stand out by their undying love for ones that they care for. They may seem to be an open and caring person, but on and off they will also show their cautious side. Feeling secure is important to them so don’t think these creatures will jump to conclusion without much investigation first. The CET signs are conservative so they have traditional values and beliefs. They are stable which many people can rely on them for help. The bravest of them all, who could that be? You’re right the Cancer Earth Tigers. When someone needs a hand, they are not afraid to lend theirs. They also have a vast amount of energy which they can become very fun to be around. 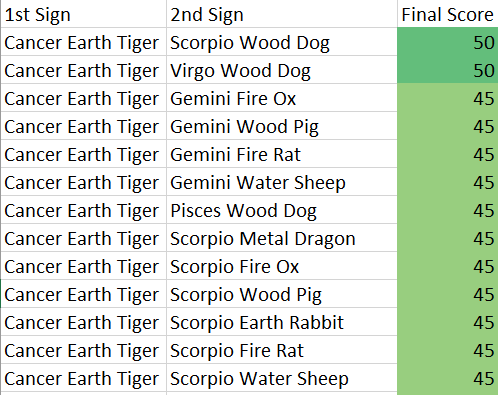 Cancer Earth Tigers can become moody which makes them overbearing for people to be around. They can be clingy which makes it difficult for them to let negative things go and move forward with their lives. The CETs can be selfish and will sometimes and will not care for other people. They are also stubborn so don’t try too hard convincing them that they’re wrong because the argument may not have a conclusion. The Cancer Earth Tiger can be disobedient. They do not like to be told what to do, in fact, they prefer being in control. They can also be hot-headed so try not to make them angry because you can unleash the beast inside of them.